A guide to some of the rarest birds in existence, brought together by the maps showing where in the world you can find them. 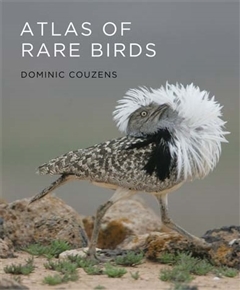 The book will focus on 50 captivating stories of the very rare, including remarkable discoveries of species new to science, rediscoveries of species not seen for centuries and 'back from the brink of extinction' successes like Seychelles Magpie-Robin and California Condor. Each species has its own mini-chapter and the book will be broken down into key groups of species, with the five most amazing tales of island endemics, five most bizarre cases of a bird becoming threatened, and so on. This will be an accessible, readable and visually appealing take on a serious subject of threatened birds and possible extinctions - a topic that is constantly in the news due to increasing concerns over climate change and habitat destruction. The atlas format shows the global nature of the problem and brings together the many strands of the concerted bird conservation effort that is taking place on every continent. It also lends and element of accessibility to the reader as many of the species featured can be watched on birding tours these days. Wszystko, co wypada wiedzieć o ptakach świata! Poznaj ponad 240 ptaków z wszystkich zakątków świata!